“I work as an advocate in the shelter at Tundra Women’s Coalition, which helps victims of domestic violence and sexual assault. I have had an amazing JV year and am very thankful for my time in Bethel. Having the spring retreat here as our last official event with JVC Northwest was very emotional for me but also very rewarding. When I first arrived in Bethel, I had a panicky feeling as an FJV drove us around town before taking us to our house. Thank God, for whatever reason, I honestly felt better about Bethel the very next day, and my excitement to be here continually grew. It is a special place, and it didn’t take me long to see that. We found out early on that the spring retreat would be here, and my first reaction was disappointment because I wanted to go to a new place in Alaska. 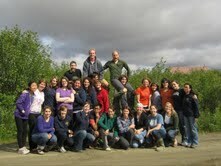 But then the more I thought about it, I realized that it would be good to have the retreat in Bethel. Not only was I excited for people to see it and experience it, but also it seemed fitting to have it as the last retreat site. You really are able to get away from it all when you come out here, and that kind of a place is, in my opinion, a very appropriate setting for a retreat focused on spirituality. Fr. Ted is a Jesuit who lives in a village called St. Mary’s, and he facilitated the retreat. We did group sessions but also had a lot of time to do our own reflection. One of his questions at the beginning was “What do you hope to get out of this retreat?” For me personally, I wanted to think about the year, just absolutely everything about it: good experiences, bad experiences, new experiences, uncomfortable experiences. I wanted to think about how I was challenged, where I fell short, and most importantly, how I am ruined for life. Curious about the JVC Northwest motto, Fr. Chuck (the Jesuit here in Bethel and an incredibly special person,) asked all of us volunteers what we had leaned this year that had changed us. People shared many different lessons like the value of honesty, the importance of self-care, and forming truly genuine and loving relationships. I felt so thankful to be sitting in that group of Alaska JVs that had given so much of themselves throughout the past year. They are good, kind, dedicated people, and I know that we all have so much to offer in our lives. I will miss this year and life as a JV. However I do feel ready to move on, and I will always carry it with me. I honestly believe that I have been ruined for life in a way, and for that I will always be grateful to JVC Northwest. ← summer in our garden.